I perform an special presentation for the school or classroom. 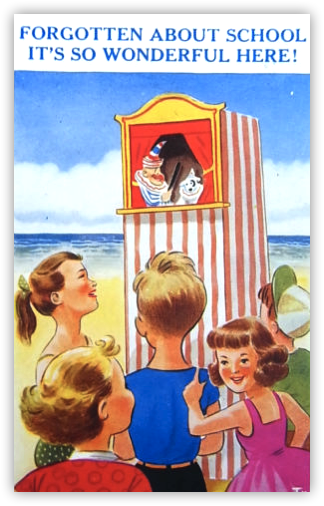 I generally start with a short talk that can include specific references to the topic that is being covered, whether it be the seaside, toys and puppets or perhaps the Victorians for example. Mr Punch first appeared around 350 years ago in an appearance in Covent Garden and I trace his history from Italian theatre to the Victorian seasides of Great Britain. After the short talk, I do the traditional short audience warm up before the Punch and Judy show proper. I teach the children the traditional responses such as "its behind you" and "oh no you didn't" Then I do a sleight of hand magic show where objects appear and disappear and a steady supply of silver coins is produced from the children's ears.